Proper dental care begins at birth. There are many things you can do to help ensure that your child's teeth and gums start and remain healthy. From proper oral hygiene habits (it's never too early) to eating healthy foods, you can play an important part in laying the groundwork for your child's oral health and overall appearance later in life. Eating a balanced diet and limiting the number of snacks between meals can help prevent the long-term effects of gum disease and tooth decay in your child. Good foods to eat include fruits, uncooked vegetables, yogurt, and cheese. Your child's saliva protects the teeth somewhat by neutralizing the "demineralization," or damage, caused by plaque formation. (Plaque is a film of bacteria that forms on teeth and gums after eating foods that produce acids.) Chewing sugarless gum is known to encourage saliva production and can help prevent plaque from forming. Brushing and flossing are the best known methods for eliminating or reducing plaque, and tooth decay. Fluoride in toothpaste and rinses, as well as in the water we drink, is a substance, which like saliva, "re-mineralizes" (keeps healthy and solidifies) the surfaces of our teeth. Highly concentrated fluoride gels, mouth rinses, or dietary supplements are other sources of this important substance. In addition, anti-cavity varnish, or sealants (which are thin, plastic coatings) also provide an additional barrier against harmful bacteria and other foreign matter. We recommend that you bring your baby to see me by the first birthday, or within six months of the first tooth growing in, this is generally when the first tooth comes in. Early examination and preventive care will protect your child's smile now and in the future. 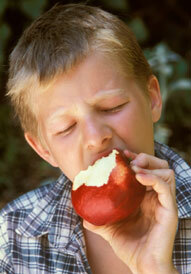 In addition, children with healthy teeth chew food more easily and learn to speak more clearly. Dental problems can begin early - even in infancy. Semi-annual check-ups allow our office to spot early conditions, such as baby bottle tooth decay, teething irritations, gum disease, and prolonged thumb sucking. Yes, decay can set in from using a bottle during naps or at night, or when your baby nurses continuously from the breast. Baby bottle tooth decay is caused by exposing your child's teeth to liquids containing sugars. Culprits include milk, formula, fruit juice, sodas, and other sweet drinks. The sugars in these liquids pool around your baby's teeth and gums, feeding the bacteria that lead to plaque. Pacifiers dipped in honey, sugar, or syrup are invitations to decay in your baby's teeth. Encouraging your child to drink from a cup as he or she approaches the first birthday can stave off baby bottle tooth decay. You should avoid allowing your child to fall asleep with a bottle; nighttime breast feeding should be avoided after the first baby tooth begins to erupt. Drinking juice from a bottle should be avoided. When juice is offered, it should be in a cup. It is recommended that children be weaned from a bottle as soon as they can drink from a cup, but the bottle should not be taken away too soon since the sucking motion aids in the development of facial muscles and the tongue.